Women on a Mission: Mom Edition: More Easy Halloween Decor Ideas from Ethne's House. 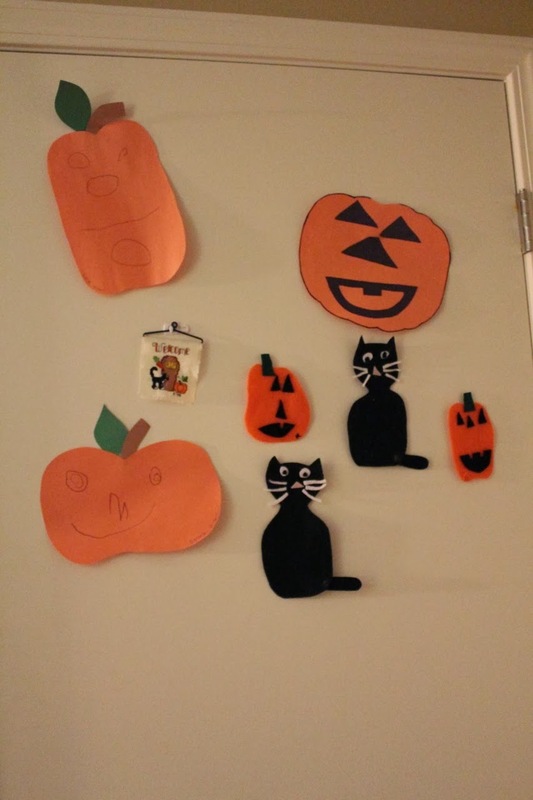 More Easy Halloween Decor Ideas from Ethne's House. 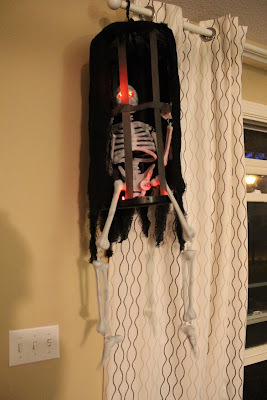 Well, like Lori, we’ve been doing some serious Halloween decorating up in here. Beware! 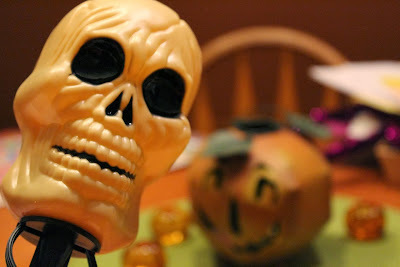 This guy came from Target yesterday; most of my other decor was from Target post-season clearance (except those wee glass pumpkins in the background there - those are from my bff Dot). The girls didn’t have school on Monday so I stayed home with them. 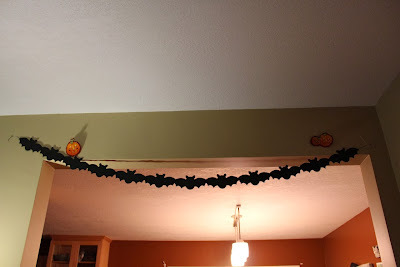 I nearly broke my neck getting the (orange) decorations tub out of the storage in the garage – think Clark W. Griswald, Jr., decorating his house for Christmas. Then last night Shaun took KD on a surprise run to a store. I told him if the store happened to carry Diet Coke and milk, we were in need because Target was out of my DC Sodastream syrup today. And are a lot of you with me that you go through a lot of milk these days? So here’s what we’ve got. I didn’t take pictures of all the décor in nooks and crannies, and the skull lights around the front door didn’t turn out well at night, so I’ll have to try again – but this is the gist of our Halloween spirit. We’re covered. This cheap-o package of bats from JoAnn was tied together to make a banner with black thread (by me). The pumpkins are lapel pins my mom made with her students using felt, fabric and Wunder-Under. 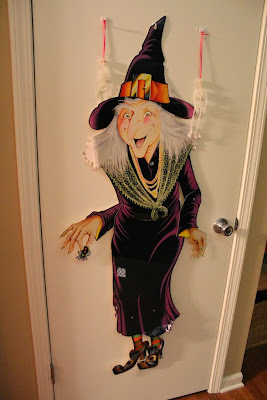 The other closet door has our witch that mom got when we were kids. She's witchy but not too scary. Her moveable joints are fun for the girls. The skeletons are glow-in-the-dark. 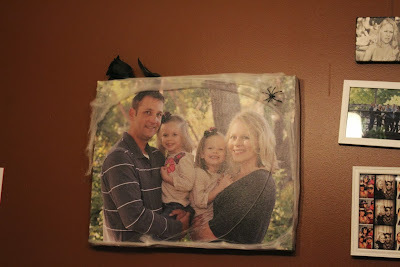 You can make just about anything a little scarier by adding some spiderweb. The stuff is cheap-o. The kids think it's great - and it doesn't damage anything. Making your pictures crooked - seems to fit. This guy is one of my favorites. We have him on a stool and propped up with movies so he looks out the front windows. Shaun and KD got me a teeny version for my couch's end-table last night. So sweet. This creepster is probably our most expensive at $35. Shaun said he didn't mean to buy him last night, but then KD was afraid of him, so he had to buy him on principle. The girls think he's the best ever - rattling, cackling, lighting up and generally making a scene. 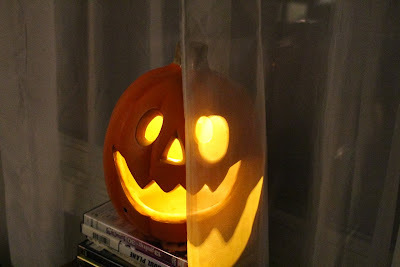 We'll put him outside for trick-or-treating I think, but he's an indoor thing. This is our graveyard, complete with skeleton coming out of the ground. I don't think it cost more than $10, give or take a few bucks. You can see the light-up skulls in the top right of the photo. 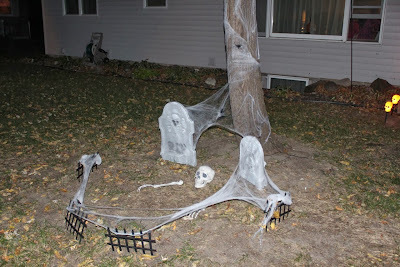 Those were also pretty cheap at Target and look great around our front steps.